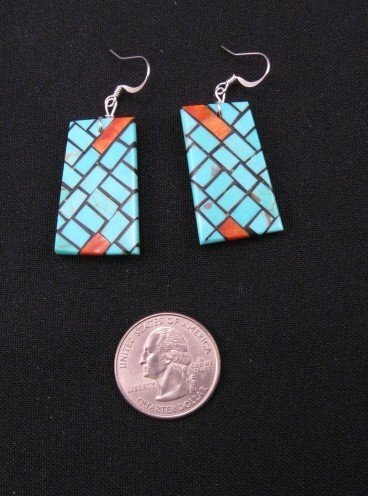 These contemporary Santo Domingo inlaid mosaic earrings were created by Julian Coriz from Persian Turquoise and spiny oyster. 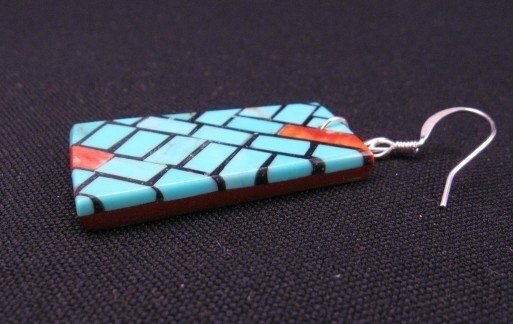 The rectangular earrings measure 1-3/8 long (plus the length of the ear-wires) by 3/4 wide and weigh 6 grams each. Sterling silver ear-wires. They appear to be inlaid on reddish-brown pipestone. The earrings are a masterpiece of inlay work. About the artist: Julian Coriz started at the early age of ten, when his uncle, the famous artist Martin Lovato, taught him the secrets of this wonderful craft. He also learned his craft from watching from his parents and grandparents. 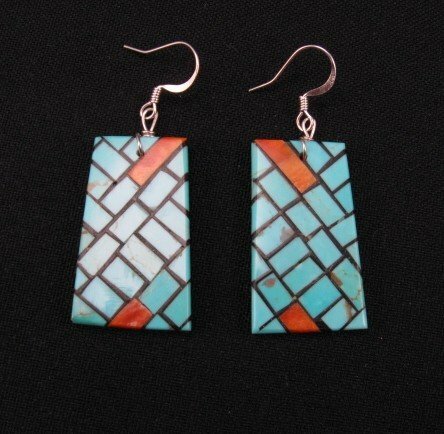 His favorite pieces to make are inlay earrings like these.